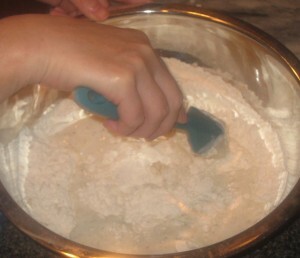 One of the most commonly used methods of mixing batters is the muffin method. Not mixing your batter correctly could lead to finished baked goods that are tough or don’t raise properly when in the oven. This method is almost always used in muffins and quick breads. When a recipe calls for the muffin method most people tend to over beat or over mix their batter thinking they need to get it all smooth. So, it gets mixed until all the lumps are gone. When any recipe calls for the muffin method don’t do this! 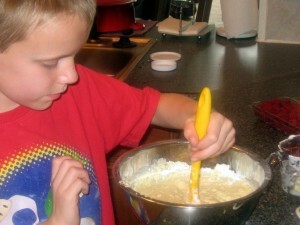 Below are the steps for any recipe of muffins or any recipe that calls for the muffin method of mixing. Following these steps will give you perfectly risen and tender muffins every time if you have the ingredients right. To start with pick any muffin recipe you like. I’ve got ones posted for Blackberry Muffins, Raspberry Muffins, Oatmeal Maple Muffins and a Cranberry Ginger Quick Bread. These recipes all use the muffin method of mixing. It is usually easiest to measure prepare all your ingredients in their separate bowls before combining and mixing. If things need to be chopped or measured for adding this is a good time to do it. 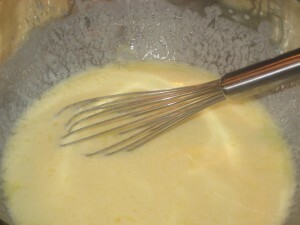 Start by combining all the dry ingredients for the recipe in a bowl large enough for the entire batter when finished. 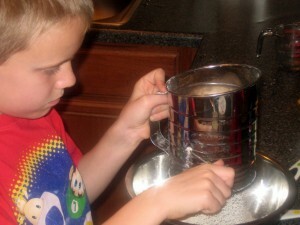 Sifting them is the best way to aerate and get them thoroughly combined. 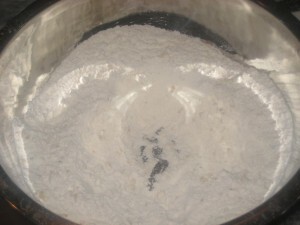 Sometimes additions such as nuts, fruits or vegetables are added into the dry ingredients at this step. When doing carrot or zucchini muffins and breads this is a good way to get them incorporated so you don’t have to mix too much when adding the liquids. Combine the wet ingredients in a separate bowl or measuring cup. Pour the liquids into the center of the well. 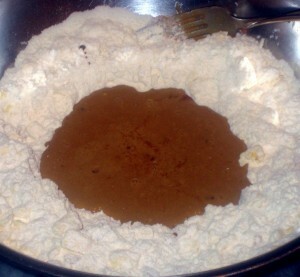 Pull the dry ingredients into the center of the well with a spatula and mix gently just until the mixture comes together and is combined. If adding any nuts, fruit or other additions this is generally when they are mixed in. Some recipes call for them to be mixed into the dry ingredients before mixing in the liquids. Combining the wet ingredients into the dry. 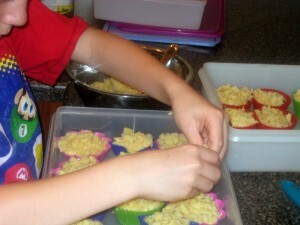 Put the batter into prepared muffin cups or baking pan. Put any topping on. I find it easiest to use my fingers to get a crumb topping spread evenly. Alternatively you can freeze unbaked muffins in their paper or silicone muffin cups and bake them at a later time. Store them in an airtight container. They will bake for the same amount of time the recipe calls for and be fresh and hot when you want them.